Willis “Bill” Dean Ressler, 92, passed away peacefully on November 23, 2018 at the Minnesota Veterans Home in Fergus Falls, Minnesota. Bill was born to Floyd and Rose (Shultz) Ressler on September 19, 1926 in Shell Rock, Iowa. He graduated from Hampton High School in Hampton, Iowa in 1943. Bill entered the U.S. Army Air Corp during World War II, serving stateside from 1943 to 1945. After his service Bill began a career in retail sales management with Gambles-Skogmo in Spencer and Algona, Iowa. He then became the district manager for Montgomery Wards in several locations throughout the Midwest. He transferred to Fergus Falls, Minnesota in 1983 and continued to work for Montgomery Wards until the store closed. He became the manager of TelNet until he retired. In his retirement, Bill was the custodian for many years at the Federated Church. He was also an honorary lifetime member of the Moose Lodge 496 in Spencer, Iowa. 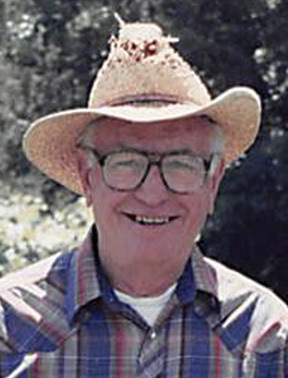 Bill enjoyed fishing, gardening, dancing, his dogs, a good Louis L’Amour novel, telling a good (or bad) joke and time spent sitting in his garage with a brandy and a cigar. People were drawn to his warm smile and quick wit. He was a shining light and always had a supporting word. He is survived by four children, Suzanne (Gerald) Bormann of Guttenberg, Iowa, Nancy (Steve) Waller of Breezy Point, Minnesota, Robert (Linda) Ressler of Fergus Falls, Minnesota and David (Patty) Ressler of Custer, South Dakota; step-son Randy (Shirley) Gregory of Mazeppa, Minnesota; fourteen grandchildren; nineteen great-grandchildren; sister Lois Johnson of Conroe, Texas; his special friend Lois Kern of Fergus Falls, Minnesota and numerous relatives and friends. Bill was preceded in death by his parents; first wife, Jane Ressler; a second wife, Doris Ressler; sister, Donna Hull; step-son, Roger Gregory and two infant grandchildren. There will be a memorial service at the Federated Church in Fergus Falls on Thursday, November 29th at 11am.